The world of foam polymers can become confusing, with the hundreds of minor differences in structure, compounds and molecular makeup creating completely unique and individual products. The large number of ways these materials can be manipulated is what makes them so versatile, with highly-specialized products for a particular job being created, with only a minor change in formulation making a big difference. This is a great benefit in that users rarely have to compromise on a material that only satisfies some but not all of their requirements. The drawback however, is that the numerous iterations of a material can make finding the perfect one difficult. Because of this, the U.S. General Services Administration introduced Commercial Item Descriptions A-A-59135 and A-A-59136 in 1997, to help with the identification of materials. A-A-59136, which specifically addresses the qualities and categorization of “Cushioning Material, Packaging, and Closed-Cell Foam Plank,” makes use of a three-tiered system for identifying material type and characteristics to make the identification of these products easier. The other item description, A-A-59135, covers “Packaging Material, Sheet,” which pertains more specifically to dunnage uses. These commercial item descriptions are different from some other standards, in that they do not measure capability. Instead of evaluating a product, they merely categorize and define materials for easier identification, after performance characteristics have been measured. The description A-A-59136, aimed at “cushioning and packaging applications,” breaks identifying qualities into three categories: Class, Grade and Type. With four sub-categories to define a material under each listing, this format not only makes identifying proper materials easy, it also helps when comparing and contrasting products. 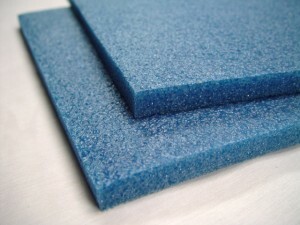 The first value is Class, which identifies what type of foam the material is. While this may seem to be obvious, the similarities in foam materials can make confusing one product for another fairly easy. Class 1 material is general purpose polyethylene, Class 2 products are general purpose polypropylene and Class 3 is general purpose material, specified by its procuring activity. All three classes of materials are in an uncut state. There is also a fourth Class that includes special purpose forms that have already undergone processing and cutting and are specified by their procuring activities. These designations are important for situations where companies brand their products with a new title, making it difficult to identify the actual material. 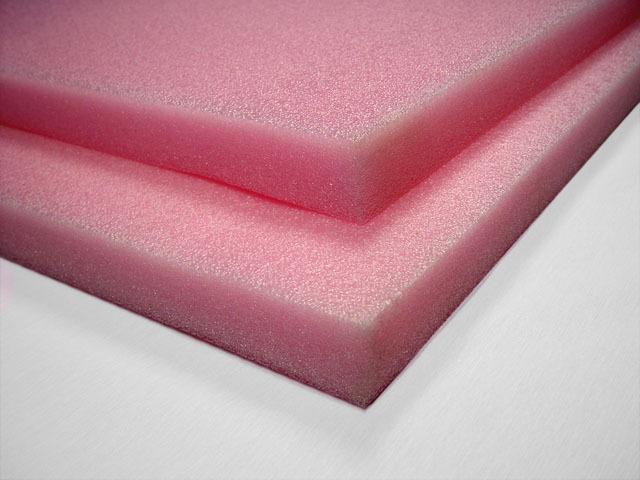 Using this item description, if a material is labeled Class 1 for example, no matter what a company has named their product, it can be quickly identified as polyethylene foam. The second category in A-A-59136 is Grade. This assigns traits to the now-specified foam type. Being cushioning and packing materials, the foam types covered will encounter any number of products that may require special characteristics to ensure packaging safety in transit or storage. The Grade assigned to a material states what specialized qualities, if any, a foam possesses. Grade A reflects a standard, untreated material. Grade B states the material contains static dissipating characteristics, important for the packaging of delicate electronics. These anti-static foam materials prevent the collection of potentially damaging electro-static charges that can be released into the product, damaging or even destroying it. Grade C means the foam inserts have fire retardant characteristics, often required for insulating applications. A Grade D classification means the material contains both anti-static and flame retardancy qualities. These values make it easy to see if the characteristics of a product meet a job’s requirements and also help standardize material requests through uniformity. The third classification is Type, which refers to the compression creep value of a foam, or its permanent deformation under stress. The parameters of this requirement state that a material’s average creep may not be greater than 10 percent of its original thickness after 168 hours of testing. The assigned Types correlate to the weight required to create that 10 percent creep. Type I requires only 14 Kg, Type II 21 Kg, Type III 25 Kg and Type IV requires 37 Kg. These values are a way of categorizing a material’s strength, the only interpretation of performance ability in the item description. A-A-59135 meanwhile, states its use as being geared towards dunnage; the packaging used around items in transport by freight, rail or waterways. Just as vital as ensuring a product’s packaging is secure is keeping that packaged shipment safe while being transported. Damaged products cost consumers, retailers and manufacturers an incredible amount of money every year, so securing product shipments properly is just as important as securing the product’s own individual packaging. This commercial item description states that a packaging material’s performance is dependent on its end-use and other factors. Because of that, the scope of materials included in this item description is wider than what is found in A-A-59136, including starch based sheet material and paper and cellulose sheet material, in addition to the more traditional polypropylene and polyethylene plank materials. A-A-59135 uses a similar organizational structure for classifying materials, but with a more simplified layout than A-A-59136. Specifically, it omits a classification for Type. There are five classes, with Class 1 being general purpose polyethylene sheet material, and the other four being an assortment of other foam, paper and uniquely specified materials. Grade designations are identical to A-A-59136 though, with Grade A being a standard, non-specialized material, Grade B being anti-static, Grade C being fire retardant and Grade D having both anti-static and fire retardant qualities. These characteristics are as important in dunnage use as they are in specific packaging applications, considering the multitude of ways a shipment can be transported, as well as the forces and conditions that may be present during its transport. The benefit of these product classification systems is that they allow users to produce a code that allows very similar materials to be classified, compared and differentiated. It helps remove ambiguity and miscommunication from the ordering of materials by making it very clear what each category does and does not include. For example, using these categorization methods, an individual looking for fire retardant polypropylene for use as a cushioning material can contact sellers with a request for a Class B, Grade C material, greatly reducing margin for error. By making these designations as clear as they are, materials simply will or will not have a respective quality. The only specification required, in addition to the classification code, is which description number you are using, A-A-59136 or A-A-59135. It also allows manufacturers to list their products and organize inventory according to the categories, simplifying their processes. A classification system like this is beneficial to consumers, retailers and manufacturers alike, by helping to simplify what often becomes a confusing process. Note: This post is to be viewed as a general overview of these specifications, and not intended to explicitly suggest or implicitly imply that The Foam Factory carries products that meet any or all of the requirements stated in the noted documents.